The results showed an increase in SES’s technical reach in Europe, Latin America, Asia-Pacific, and Africa. In Africa, this included the addition of Kenya to the survey where more than 2 million TV homes across the country rely on SES for their TV content. In Europe, satellite broadcasting, and especially Direct-to-Home (DTH), remains the leading distribution technology, with SES serving 167 million TV homes across the continent. The SES fleet is also delivering video content to 72 million households across North America, mainly via the important U.S. cable neighbourhoods. 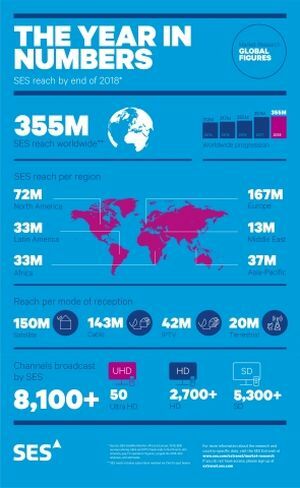 Across other markets, SES continues to expand its technical reach, which now totals 102.6 million TV homes served by key video neighbourhoods in Asia-Pacific, Latin America and Africa. “At SES, we invest in tools and services to help our customers gather information about markets they operate in so that they can be even more successful in their business. The Satellite Monitor is one such tool that demonstrates the long-term value of SES’s core video neighbourhoods and extensive reach to our customers,” said Ferdinand Kayser, CEO of SES Video.